In the office, courtroom, or judge's chambers, exhibit labels help eliminate the costly time spend searching for and referencing exhibits. They mark the subject so it can be identified at a glance. 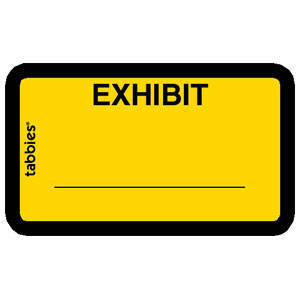 Exhibit labels are color-coded and available in 10 variations, with a blank space for writing exhibit letters or numbers directly on the label. Self-adhesive labels peel off the sheet and can be attached directly to an exhibit or file. 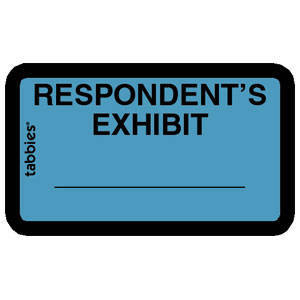 Labels are 1-5/8"W x 1"H. 9 labels per sheet. 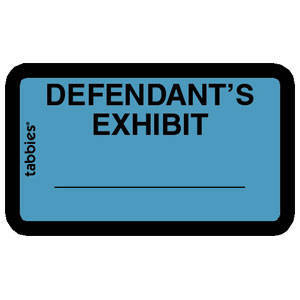 Sheet size is 5-1/4"W x 3-1/4"H. Writable only. This product is not intended to be printed on.